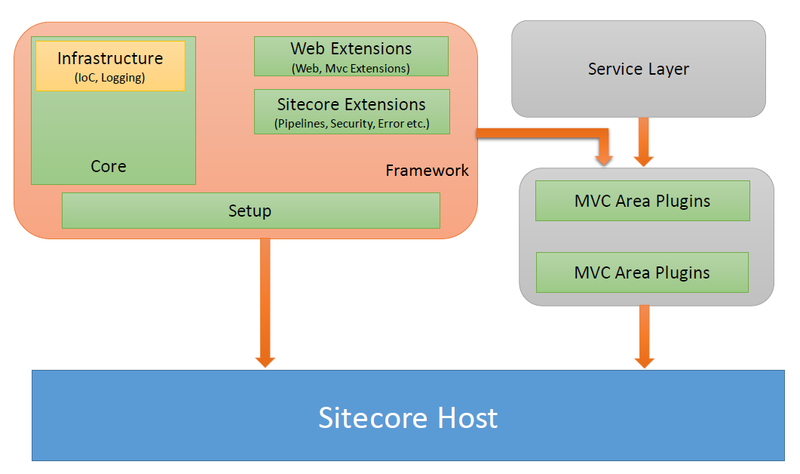 It’s been 3 year I have been working on Sitecore Mvc (6.6 & 7.2) and had seen some of the bad and best enterprise framework laid out for Sitecore development. With Sitecore it is really important to structure the solution correctly to facilitate development team to design a scalable solution and code without worrying about another part of the application. It is also important to develop individual components without any dependency on the functional or non functional part of the code. This tempted me to write an abstract framework or layout the basic building block of the application which are required for any Sitecore Mvc development. I have found other frameworks available e.g Sitecore Mvc Contrib or Sample Sitecore Mvc but I haven’t used them so far. It is not possible to cover all the feature in this post and it may require a series of post to cover it. Following are the feature included so far. I will turn them in links once I have the relevant post out. This Project is designed using Sitecore 7.2 and Mvc 5.1 and here is how it looks like from solution alignment point of view. The key consideration here is to un-touch the Sitecore Host project and code outside of it using pluggable module, on build just deploy the required files in host project’s respective directories and run the application. This open up the idea of deploying individual component as separate module in Sitecore via xcopy, nuget package or any other deployment mechanism. It helps in environment where multiple teams are working independently. Exception handling is designed to handle the application error via HttpModule and Mvc specific one with Sitecore’s Exception Processor. The important part of it is that it avoids the redirect and render the error page content along with correct error status code. Framework keeps the error handling simple but it doesn’t stop if there is a need for richer experience. I wrote about it long back here , this can be still applied to present more customized solution. Dependency Injection is achieved via a Framework IoC class but it internally rely on a container which could be any container available, either Unity, Windsor or any other. This allows less dependency on the DI container and build application specific code. The current application uses Unity as sample implementation. Logging implementation is asynchronous and it uses BackgroundWorker class to process log to consuming framework. The current implementation uses a simple file to write the log. It can be enhanced to use the new .net based async/await support or AsyncCollection for cleaner implementation. The other major feature it supports is ClaimsIdentity over the existing IIdentity implementation for Claims based access. It allows access to User attributes in the runtime for more fine grain control over the user properties and access. This can further be extended to support Federation authentication within the application. I haven’t added the full glass mapper example and unit testing yet but that’s in-progress. Infrastructure- Infrastructure project contains dependency injection and Logging functionality. Sitecore Extension- This project contains extensions for Sitecore areas & error handling pipelines, support for ClaimsIdentity and some helper classes. Web Extension- Currently it has helper and extension classes to support Form Post. Setup- This project contains unity based DI implementation, file logger and application bootstrap to wire-up all project together without making any modification in Host project. Module is nothing but collection of Mvc projects with area registration classes to support pluggable application development and it can be deployed to Host project as package. Host is a Sitecore project and it works are integration point for Framework and pluggable Mvc modules. Download the source code for this article from GitHub and open the solution in Visual Studio 2013, you will notice it has all the projects available but host project doesn’t have much except, App_Config/Include/Framework for config file required by Framework, empty Areas folder, script and content folder for jquery and bootstrap css files. Download the Sitecore 7.2 from SDN. Copy below files/folder from Sitecore7.2 downloaded zip file to Host project directory. Once everything is ready, build the solution and it should generate the required assembly inside the Host project’s bin folder to run the application. This solution is still in development and not been used on any production environment. I am trying my best to test out all the aspect of framework but if you are planning to use this framework, let me know and I will try to help you set it up, just shoot me an email. Any feedback, drop in the comment section or email me. Default GlassMapper demo application uses CastleWindsor as DI container to resolve the dependencies in the runtime. This is also documented as part of the 1st tutorials on glass mapper site. There is another implementation with SimpleInjector but in situation if you are using Unity as DI Container in your application this will not work you need to either use unity with CastleWindsor or change the implementation. I did see a question related to Unity on the Glass Mapper google group forum. Glass Mapper’s CastleWindsor DI implementation has 4 component. I used the same implementation and converted to work with Unity. /// Creates the standard resolver. Sitecore installer class is really a big one and it uses IWindorInstaller implementation to partition the registration logic. As I am not aware that unity has any extension to support that, I created an extension to support it. As it is huge to copy the entire converted SitecoreIntaller code here, I am just giving the extension interface and method which I used to register the Sitecore Installer. Sitecore Installer and other installer classes will implement IUnityInstaller class and register the mapping of type with IUnityContainer object passed around. I haven’t tested the complete code yet as I am still trying to build the framework piece before starting the actual development. In case if you have any issue drop me a note and I will look into it. Implement Session Timeout feature in Sitecore and support default form authentication behavior of authentication cookie renewal/expiration and sliding expiration. I looked around the login method and it was called in a standard manner with a call to Sitecore’s Security API’s AuthenticationManager.Login method, which got seven implementation variant, I am listing 3 most commonly used functions, it intern calls the current authentication provider’s login method which internally calls the FormAuthentication.SetAuthCookie after validating the user name and password with Membership Provider. /// Logs a user into the system if the <paramref name="password" /> is valid. /// Logs a user into the system without checking a password. Our developer have used last method for authentication by passing the UserName, Password and Persistent flag. For implementation I got two option either to pass the persistent flag as true or false. Let’s look at the result. documentation, it will create the persistent cookie which will be available across the browser session and will be available till the expiry date based on timeout value. I can not use this option due to cookie being available after browser close and in case someone else open the site before cookie expiration he might see previous user’s data. value based on timeout value defined or default to 30 minutes. This is good as if user closes the browser cookie will be destroyed. I opted for 2nd approach as it avoid any accidental behavior from user and set the timeout value to 5 minutes to validate the behavior. A quick debug look in immediate window gave a different result. Though Sitecore.Context.User.IsAuthenticated return true but at the same time it also return true value from FormAuthenticationTicket.Expired field. I am not sure what is really causing this but it could be potentially due to sitecore pipelines running in BeginRequest event but FormAuthentication handles this in AuthenticateRequest event. I looked at the AuthenticationHelper’s code in Sitecore using Telerik’s justDecompile and it seems it does a null and null/empty value check on authentication ticket but not on expiration flag may be thinking it is automatically taken care by FormAuthenticationModule in the AuthenticateRequest event pipeline. It also expires the cookie if authentication ticket is null or has null/empty value and set a flag (‘SitecoreAuthenticationErrorHandled’) for the request, I have reused the same code below to be compliant with sitecore pipelines. A custom Sitecore pipeline to check for FormAuthenticationTicket.Expired flag and expire the cookie if flag value is true, this is currently being partially done inside the Sitecore’s AuthenticationHelper.GetCurrentUser method else renew the ticket based on sliding expiration logic. I added this pipeline in HttpRequestBegin pipeline before SiteResolver to avoid any issues. /// Authentication renew/expire and sliding expiration processor. /// Processes the specified arguments. /// Handles the authentication error. Now, this pipeline takes care of expire/renewing the authentication ticket. At some point in my previous two project, I build the LogViewer application to view the logs generated by my app, most of the time is really easy to just go to database and query with select statement with few conditions but it is always good to have a UI tool where you can do search and sorting with few clicks. It’s not just convenient for me personally but team itself. As, I needed this tool again but I don’t have the source code from previous project, I decided to build it again from scratch and it is fairly easy and quick to get the initial version running. As, I am trying to get my hands on the AngularJS it was a good opportunity to learn and build. This tool is build on AngularJS as front end framework with bootstrap, ASP.NET WebApi as backend to support the database interactions and OWIN as framework to keep it light. I have generated the edmx file out of my Enterprise Library database and plugged into a log manager class to retrieve/search the EntLib Log table. 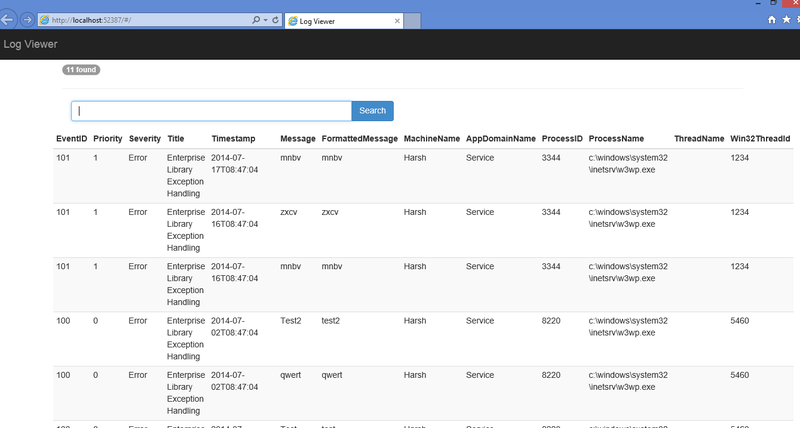 At present it is at early stage and have basic code for configuration and a log manager to fetch the data. Initial version of the code is available on the github. Lots of 🙂 currently, this application support single field search on message field, but this is just start and will keep the source code updated to support more search fields, sorting and other features. I received a request about the uses of dynamic keyword in profile declaration and in fact it was valid that while declaring the profile object we should be using concrete profile object and not declaring it as dynamic and rather its properties should be dynamic. I updated the current code by adding a new class ProfileProperties to store all the properties for Profile object. Now Profile class’s Init method looks like below. Now it is not required to have the Profile object declared as dynamic rather we can declare it as concrete Profile class. Recently, I was trying to use ASP.NET Profile Provider for one of my application but soon ran into trouble due to compatibility issues with my CMS system and complexity involved. I decided to build a generic dynamic Profile class and a Provider to support it. Code related to dynamic profile is available on github. I call this as dynamic profile just because it provide the untyped and runtime access to profile properties, this allows to work with structure without having static type. Profile class is an implementation of DynamicObject with auto detection of current context user or anonymous id, its constructor has a dependency on IProfileService implementation to get/set the data. An Init method to initialize the properties of the profile from data source with help of IProfileService implementation. DynamicObject’s method implementation TryGetMember/TrySetMember to get/set the properties in the internal memory. Save method to persist the profile properties i.e. Property Name and value in the associated store with help of IProfileService Implementation. IProfileService is the heart of the implementation, it works as Provider for Profile class to retrieve/store profile properties from a persistence store. Actual interface as such is very simple and straight forward with 2 generic method 1) GetPropertyValues 2) SetPropertyValues but implementation can be complex based on the data store chosen and logic required to store the nested values and their type. Current implementation stores the values in XML file with file name is unique to either user name or ASP.NET anonymous id, this uses different internal method to serialized/deserialize properties and values in xml along with their type name. As we are trying to store any type of property values in compile time it is required that object declared is of dynamic type. All code and a sample app with implementation is available on github. This is very basic implementation and requires enhancement in order to be used in production system, let me know if you have any suggestion and challenges in using this solution. PAP is the Policy Administration Point This is where you administer the policies changing the security rules, and policies. This is separate from the rest of the system as this is decoupled. PEP is the Policy Enforcement Point. The PEP enforces the access so this is the module that authenticates the request for validity, getting identity information and can also constrain data, cache, and gets the request and then also returns the result, usually a simple Yes or No, however in some systems the actual deliverable, the data being secured is returned from the PEP rather than just a yes/no decision. PIP is the Policy Information Point. PIP is a service that collects information for the policy decision point to use to make a decision; this is to ensure that all the information that is needed is available. The PIP usually is a front-end to many other backend systems containing the attributes you use for security policies decisions. PDP is the Policy Decision Point. This is where the magic happens, using a rules engine or something similar, the decision point makes a decision about the access request, and also can loop back to the PIP for more information as the policies are executed. You attempt access to a secure system, you will essentially be calling a PEP (enforcement point) which will check your authentication to ensure you are who you say you are, if you are authentic, it will forward request to PDP. PEP packs this information along with roles and claims to the PDP for a decision to be made about you. PEP will check cache and return, if not available, it will then try to make a decision, most likely getting information from PIP to make a decision about your authorization access. PIP will query all identity system usually Active Directory or some Identity system. PIP will also query any other systems if needed, and send this back to PDP for decision. 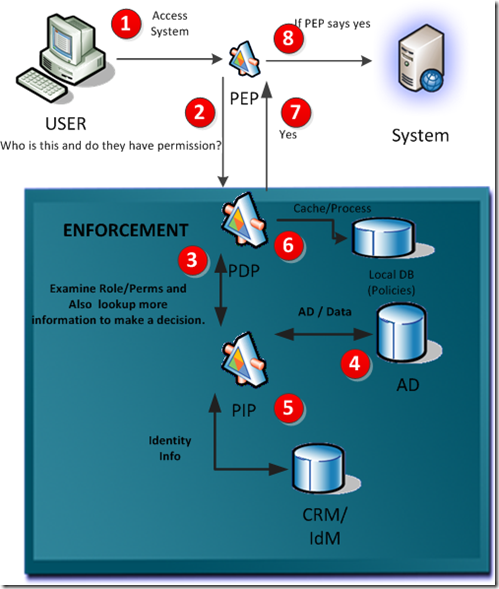 PDP caches data from PIP and makes a decision about authorization. PDP sends decision back to PEP to then allow request or deny. PEP allows or disallows request based on policies. 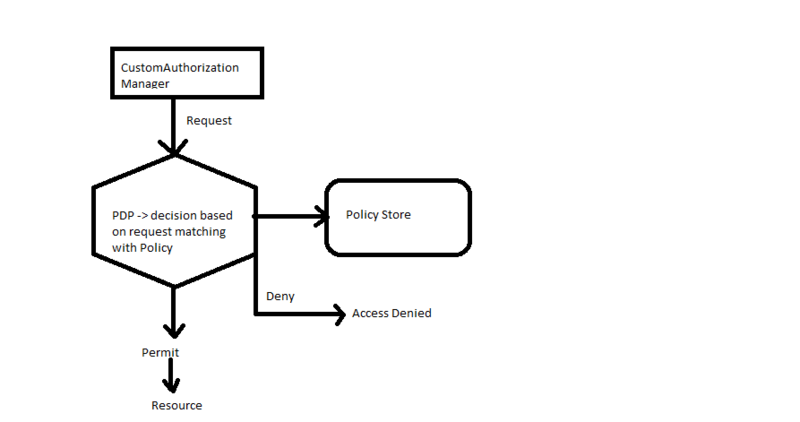 A policy is an XML document that describes a couple of things needed to grant permission or access to a resource. 2. Resource – “WHAT” is the resource being requested. Deny-Overrides: This is that a deny permission will always override a permit, so that if you have 100 rules applied to you, if only 1 of them is deny, you cannot access, this is a more default-secure method for security. A Target has a Subject, Resource, and Action, and Rule, and a Policy Set and Policy. A Rule has an Effect and 0 or 1 Conditions, and a Rule Combining Algorithm. A Policy Set has a Target, A Policy Combining Algorithm, and 0 or 1 Obligations. Policy for Conformance Test IIA001. DemoUser can read about page. Per XACML reference architecture, PIP is the system entity that acts as a source of attribute values. Basically if there are missing attributes in the XACML request which is sent by PEP, PIP would find them for the PDP to evaluate the policy. Therefore, finally PDP just have to perform the “string-regexp-match” function on these two attribute values “bob@wso2.com” and “[0-9a-zA-Z]+@wso2.com”. Init (Properties properties) Here you can write the logic to initialize your module. Any properties that are defined in the entitlement-config.xml file, can be access here. Where you can pass one attribute value of a subject, a resource and an action as input value. I have modified the sample with xacml.net to demonstrate the policy based authorization. PDP will take the request and run against the policy defined. A sample policy look like this. Where r is the result from PDP. An example source code for this article can be found at github.